A sensational political scandal comes to an end with the politician's life sentence. But this may not be the last we hear of him. Yesterday, the Jinan Municipal Court convicted Bo Xilai of his crimes and sentenced him to life in prison, bringing an end to China's most sensational political scandal in a generation. Though Bo has appealed his suspension, this is just a formality: His life as a free man is over. Like any major political event, it'll take awhile before we understand the full ramifications of what the Bo Xilai trial means for China. But for now, it's worth going back and remembering who Bo is, why he got into so much trouble, and what the consequences of his downfall are. Who is Bo Xilai? Why was he important? Bo Xilai is a Chinese politician from Communist Party royalty: His father, Bo Yibo, was an important leader during the Party's earliest years in power and is remembered today as one of China's “Eight Immortals.” Like other important officials, Bo Yibo was persecuted and imprisoned during the chaos of the Cultural Revolution. Bo Xilai first achieved fame during the 1990s when he served as the top Communist official in Dalian, a coastal city then considered an economic backwater. During his tenure in office, Bo transformed the city into one of China's safest, cleanest metropolises—a destination attractive enough to serve as host of the World Economic Forum's annual “Summer Davos” meeting. Later, following a stint as Minister of Commerce, Bo became the Party boss in Chongqing, a massive, inland city with a reputation for violence and corruption. Once he consolidated power, Bo—aided by his longtime police chief, Wang Lijun—executed a major crackdown on organized crime and encouraged a revival of Mao-era slogans and songs. Bo's style of leadership—heavy-handed state involvement in the economy mixed with old-fashioned populism—was so successful that it emerged as a compelling governance model for China, standing in contrast to the more decentralized, market-friendly vision espoused by then-Guangdong Party chief Wang Yang. And as 2012 dawned and China prepared for a once-in-a-decade leadership transition, Bo was considered a shoo-in for one of the coveted slots on China's highest governing body: the Standing Committee of the Politburo. So when did things go wrong for Bo? Bo's problems stem from the November 2011 death of Neil Heywood, a British businessman who suffered an apparent alcohol overdose in Chongqing's Lucky Holiday Hotel. Heywood's death attracted virtually no notice at the time, but in February 2012 Bo's right-hand man, Wang Lijun, fled Chongqing and attempted to defect to the United States at the U.S. Consulate in nearby Chengdu. Wang told the Americans that Bo's wife, Gu Kailai, poisoned Heywood after a business deal between the two had soured, and that when Wang confronted Bo with this information, Bo physically attacked him. Wang's attempted defection became an international story overnight, and the public fallout curtailed Bo's political ambitions immediately. The next month, the Party stripped Bo of his post in Chongqing and expelled him altogether that November, and Bo remained out of sight until appearing before a judge this August. Ultimately, Bo was tried for three crimes: embezzlement, abuse of power, and bribery, mostly in connection to a wealthy patron named Xu Ming who allegedly lavished Bo and his family with money and gifts. Though the verdict was wholly expected, Bo's trial was still something of a disappointment: the deliberations failed to adequately examine his anti-mafia campaign, a sweep that ensnared political rivals and meddlesome lawyers and, arguably, represented his true abuse of power. The crimes that ultimately brought Bo down are hardly unusual in the Communist Party, where corruption is endemic, and could have easily applied to other high-ranking officials. Two leaders of similar rank to Bo, former Beijing leader Chen Xitong and former Shanghai boss Chen Liangyu, were sentenced to 15 and 18 years, respectively, for similar crimes, and Wang Lijun himself got only 15. Why was Bo's sentence so strict? Bo's relatively harsh sentence is unsurprising for three reasons. First, unlike Chen Liangyu and Chen Xitong, Bo was defiant in court, defending his record and, among other outbursts, referring to his wife as “insane.” Had Bo groveled before the court and asked for forgiveness, like his wife Gu Kailai had during her murder trial, he might have gotten off with lighter punishment. A likelier explanation for Bo's life sentence is poor timing: His fall ran right into Xi Jinping's “anti-corruption” campaign, which has formed the centerpiece of Xi's first year in office. Since assuming the presidency, Xi has cracked down on visible signs of corruption, compelling party officials to cut out ostentatious signs of wealth and privilege. I've argued before that Xi's crackdown is mostly cosmetic, because corruption in China is systemic and embedded within the Party's institutions. However, the conviction and sentencing of Bo Xilai provided Xi with a public opportunity to demonstrate his resolve, regardless of whether corruption in China actually lessens. Third, Bo Xilai was no ordinary politician. Handsome, articulate, and charismatic, Bo resembled a Western politician in his public style and departed sharply from the dour, inconspicuous manner of most Communist officials. Bo's high-profile behavior in Chongqing made it seem he was almost campaigning for higher office, using his personal popularity to advance his career, which flies against Communist Party convention. Even after his downfall, Bo remained a popular figure nationwide—all the more reason for Xi Jinping to smack him down harder. 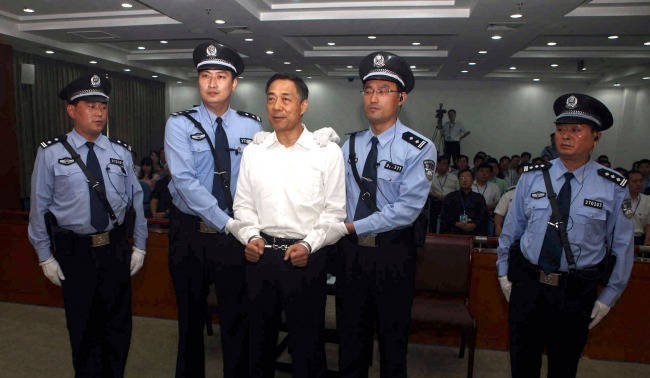 What are the repercussions of Bo Xilai's case? In the short term, Bo Xilai's downfall is bad news for his patron, Zhou Yongkang, who during the Hu Jintao years served as China's powerful internal security czar. Since assuming power, Xi Jinping has purged four leaders close to Zhou for corruption. One of these leaders, Jiang Jiemin, was actually the president of CNPC, China's largest state-owned oil company. Should Zhou be purged—a real possibility—the importance of Bo Xilai's downfall would pale in comparison. But in the long term, the repercussions will be modest, at best. The attention paid to Bo Xilai's case was more a reflection of its salaciousness than of its actual importance. The factional nature of China's politics has accounted for many reversals of fortune over the years, and sudden falls from grace are not unusual. There was hope that Bo Xilai's trial would mark a turning point in China's quest to establish the rule of law, as Rebecca Liao argued in The Atlantic last month. But despite unprecedented transparency—the Jinan Municipal Court released full transcripts of the proceedings to reporters—the incomplete, capricious nature of the trial indicated that this was business as usual for the Communist Party. So, is this the last we'll hear from Bo Xilai? When a 64-year-old man receives a life sentence, odds are typically long that he'll ever resurface. But remember: Bo will be eligible for parole in 10 years, and could be released even earlier if there's a compelling medical reason. And even if he does serve a full decade in prison, Bo will only be 74 upon his release which, in China, makes him something of a spring chicken. Deng Xiaoping governed the country until his late eighties, and the 87-year-old ex-president Jiang Zemin retains considerable power and influence more than a decade after his “retirement.” And, if the Chinese political calendar holds to form, a new leader—perhaps one with a friendlier disposition toward Bo—will have replaced Xi Jinping by 2023. In 1969, a diminutive 65-year-old man began work at the Xinjian County Tractor Factory in rural Jiangxi Province, one of China's poorest provinces. Though the man was assigned a regular job, he was no ordinary citizen: Just a few years earlier, he served as one of China's most important officials. But after encountering political opposition during the Cultural Revolution, he and his family were re-assigned, an exile that would last four years. The man's patience was rewarded, and by 1978, the then-recent employee of the Xinjian County Tractor Factory found himself with a decidedly more interesting portfolio: China's maximum leader. The man, of course, was Deng Xiaoping, now venerated as the leader responsible for China's present prosperity. The circumstances of Bo Xilai's rise and fall are entirely different, but the history lesson remains pertinent: It's far too early to close the book on Bo.